Here’s the second super quick recipe to go with that gorgeous Paleo Scallion Pancake! But this Sriracha Aioli is so good on so many things. I’ve taken to spreading it over a piece of toast, topping it with a crispy faux chicken patty, and drizzling a little extra Sriracha Aioli over top. It’d be great with seafood, burgers (oh my gosh, it’s the burger sauce of my dreams), chicken fingers. Drizzle it over a finished stir fry or add it to scrambled eggs. In short: I’m addicted. I blame my mother-in-law, who introduced us all to Sriracha Aioli for dipping crispy roasted steak fries in. Ohhhh man. 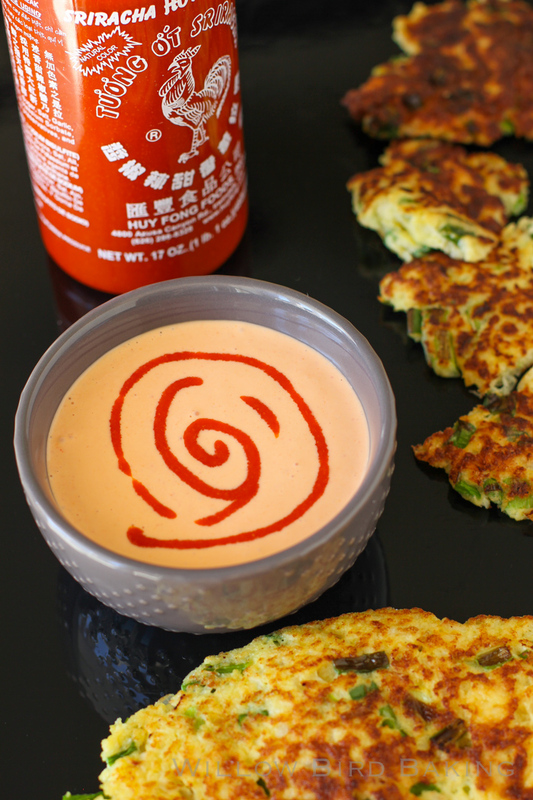 I really hope you’ll make the whole meal (Paleo Scallion Pancake topped with 5-Minute Sesame Shrimp and Sriracha Aioli) and tell me what you think, because as I mentioned, it was the best meal I’d had in a long time! And the perfect quick, healthy weeknight meal at that. This Sriracha Aioli is perfect drizzled over fish, spread on the toasted bun with a juicy burger, or drizzled over a stir fry. I've been putting it on everything lately. Most recently, I drizzled it over my 5-Minute Sesame Shrimp on top of a Paleo Scallion Pancake and it was amazing! It's best the day after you make it, when the flavors all meld. Double it for a big batch! Serve drizzled over seafood, meats, stir fry, burgers, or as a dipping sauce for fries, veggies -- the sky's the limit! This is the perfect go-with-anything sauce! This is perfect with Baked Crab cakes!! dollop on the plate and run a spoon through it to make it look like a comet curving on the plate, then place the crab cake with a little greens. Looks and makes it taste five star! Add a little Thai sweet chili sauce. Awesome!!!! I didn’t have lemon so I used a lime. It was amazing! New favorite way to eat burgers!